"These are more like small thin pancakes than a real crepe. They make a tasty breakfast meal and are wonderful when topped with hot fresh blueberry sauce (fresh blueberries heated on the stove with a little flour). The flax seeds add a subtle nutty flavor and the cinnamon and nutmeg add a hint of spice. Enjoy!" Beat eggs, soy milk, and olive oil together in a small bowl. Mix all-purpose flour, whole-wheat flour, flax seeds, salt, cinnamon, and nutmeg together in a separate bowl. Stir the egg mixture into flour mixture until well mixed. Heat a lightly oiled skillet over medium heat. Pour about 1/4 the batter in the hot skillet and cook until batter turns from wet to moist, and the edges begin to curl away from the sides of the skillet, 2 to 3 minutes. Flip and continue cooking until lightly golden on the other side, 1 to 2 minutes. Place cooked crepe onto a plate, and cover with a kitchen towel to keep moist. Repeat with the remaining batter, lightly oiling the skillet as needed to keep the crepes from sticking. See how to make light, delicious homemade crepes. 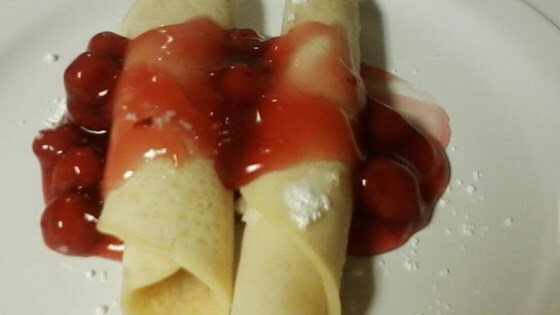 I love crepes and this is a great recipe. I made a few alterations: I decreased the olive oil to 1 tbsp. and added 3 tbsp. of vanilla. The spices and flaxseed give them a great flavor.